Dog waste removal, or becoming a pooper scooper, may be dirty work, but it's a growing business for many communities. 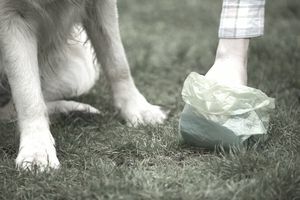 If you live in an area with a lot of dogs, the potential could be huge because many busy dog owners are willing to pay someone else to clean up after their dogs. If you're up for the challenge, you have the potential to build a successful business as a dog waste removal specialist. The startup costs are very low. It's an easy business to operate. You don't need any special education or training. It can be a good business for business owners of any age. It's environmentally sound because it protects groundwater, reduces bacteria and prevents air-borne contaminants. You can expand on your services by adding dog walking, selling dog products, etc. It's literally a smelly job and is not very glamorous. It can be a bit hazardous at times, so you need protective gloves and eyewear. You need to research and follow local rules and regulations for waste disposal. Initial fees are generally low, so you need to work on long-term contracts and servicing multiple clients in the same geographic area. You will have to work outside in all types of weather. You may need bonding and liability insurance.